With Willy's number world for hanging up and decorating, doing math is really fun! 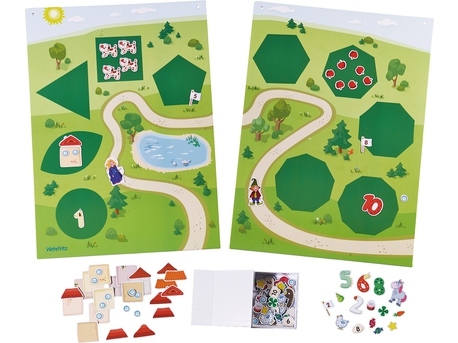 The two wall panels create a 100 x 70 cm number world with number gardens that can be redesigned over and over again with the matching magnets. This makes learning and understanding the numbers up to 10 easy. There are number houses, numbers from 1 to 10, animals, the fairy "Forget me not", the goblin "What a muddle" and many other magnets. 2 coated metal plates (each W 50 x H 70 cm), approx. 172 different magnets, folding box, fastening materials.